When people are addicted to smoking they come up with many ways of justifying their addiction. The latest way of excusing the nasty habit is vaporizers and e-cigarettes. 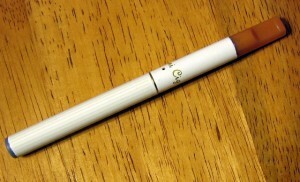 Often marketed as the sleek solution to out-of-style tobacco, vapor is the cool man’s cigarette. But don’t be mistaken: it is still providing nicotine and other harmful chemicals to your lungs. There’s no “safe” way to smoke, just in the same way there’s no safe way to do heroin or excessively consume alcohol (Sorry…“hard lemonade” and “lite beer” doesn’t make it less bad!). Rather than try to alternate to what you think is less harmful form of substance, get rid of the desire. Notice I didn’t say get rid of the addiction — I said get rid of the desire! With hypnosis, you can change the way you think and feel about cigarettes because it changes the instinctive emotional response you get when you go to a cigarette for relief. Call my office to learn more. 212-599-3195. This entry was posted in addiction nyc, hypnosis stop smoking and tagged addiction, e-cigarettes, quit smoking, smoking, vaporizers by Dr. Errol Gluck. Bookmark the permalink.